Faced with war and chaos in Liberia — war that stole her dreams and "took everything" from her — Louise Stevens fled to the United States in 2000, settling in Minnesota. Over nearly two decades, Stevens has raised a family and worked for Boston Scientific, Medtronic and a firm that cares for vulnerable adults. Now, she's facing a looming deadline that could result in her being deported back to Liberia. "How can somebody say, 'Go home?'" Stevens asked at a news conference Sunday in Brooklyn Park. "After living here for 18 years, with my kids. I have a home. I have a job. I have friends. I cannot wrap my head around, 'Go home.' What is home? As far as I know, Minnesota is my home. America is my home." Stevens is one of several thousand Liberians who have long lived in Minnesota but could face deportation within weeks. A special residency status for native Liberians living in the United States is set to expire, unless President Trump extends it. Members of Minnesota's Liberian community, along with U.S. Sen. Tina Smith and U.S. Rep. Dean Phillips, are hoping the president can be convinced to do that. 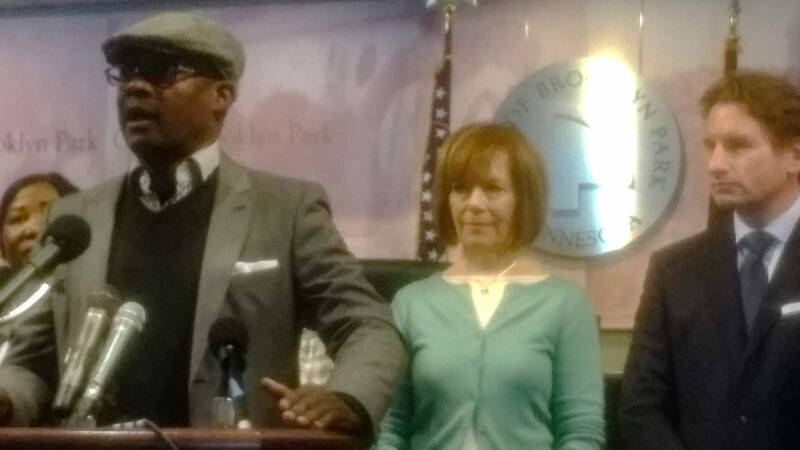 The two Democrats held the news conference Sunday in Brooklyn Park, hoping to ramp up support for Liberians who could be targeted for deportation as early as March 31. Many, like Stevens, have lived and worked in the United States for decades after fleeing war and chaos in their home country. Smith and Phillips are pursuing bipartisan legislative solutions. Last week, they joined more than 50 other members of Congress in writing Trump to urge him to extend the temporary legal status, known as Deferred Enforced Departure, for Liberians who came to the U.S. as refugees and are not yet citizens. But Smith said that at this point, everything depends on Trump. "I can't speak to what is in his heart and mind on this right now, though I will tell you that Sen. Klobuchar and I and Congressman Phillips have reached out continuously to the White House to raise this issue," Smith said. "And I know that they're well aware of it." Minnesota is home to one of the largest Liberian populations in the country with an estimated 30,000 people. When Liberians first fled to this country, they got Temporary Protected Status, or TPS. That program, and the Deferred Enforced Departure initiative, are a humanitarian effort meant to help people whose home countries have been struck by war or natural disaster. Brooklyn Park City Council member and Liberian immigrant Wynfred Russell urged people of all political persuasions to lobby their congressional representatives to allow people like Stevens to stay in the United States. "This is not a Democratic issue. This is not a Republican issue. This is a human issue," he said. "This is an economic issue. We need to come together." Liberians who could be deported fill a lot of local jobs, especially in the health-care sector. Nicole Mattson, representing a local nursing home and the state association for nursing homes and other long-term care organizations, said Sunday that Liberians in Minnesota are doing critical work and would be hard to replace in a tight labor market. If people are deported, "we are going to say goodbye to a pool of talent that is highly skilled. They're educated. They've been here. They've been committed to our organizations," Mattson said. "At my particular facility, 60 percent of our employees are immigrants, and over half of those are Liberians. Very simply, we could not do the work, we could not care for people, we could not care for seniors without them." Among the Brooklyn Park residents fearing a forced return to Liberia is Marie Zar. She's praying for intervention. "I'm depending on the Almighty God in heaven, to touch ... Donald Trump's heart. That his heart will change toward Liberians," she said. Phillips noted that the DED program has continued under Democratic and Republican presidents. And this isn't the first time the program has faced possible expiration. But Phillips said he hopes that another extension is followed by legislation that establishes a pathway to citizenship for people who, he said, have been living in legal limbo far too long. "It is time that we consider what's really at the heart of this. Which is a pathway to citizenship for people who have earned it and who are following the law and paying taxes and creating jobs and have families here, with children who are American citizens," he said.